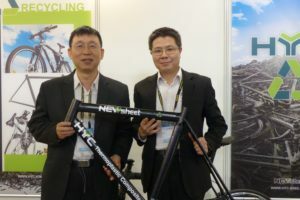 LONDON, UK – The vast majority of UK cycle sales are imports from the Far East and there is a booming but relatively tiny e-bike market numbering in the tens of thousands of units. Cycling UK suggests, based on ‘informal industry estimate’, that 30% of cycles sold are childrens’, 30% MTBs, 10% road, 26% classic/hybrid, and 4% folding/other. 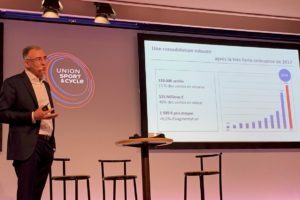 They also suggest about half of the retail value of the cycle market comes from bicycle sales, and half from parts and accessories. So perhaps the biggest news is what has not happened. A shock impact from the June 2016 Brexit referendum result has not yet materialised in the UK economy at large nor in the cycling economy. Consumer spending and wage growth have not collapsed, despite pressure on prices due to the weak pound in the wake of the result. However, there are signs pointing to possible trends ahead. 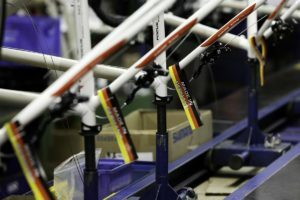 UK-based bike manufacturing remains tiny in the UK at around 70,000 bikes per year, but showed signs of resurgence. Most notable in 2016 was folding bike manufacturer Brompton’s completion of the move to their new large London factory, aiming to substantially up production from the current level of around 40,000 bikes per annum and to start manufacturing an electric assist version in 2017. 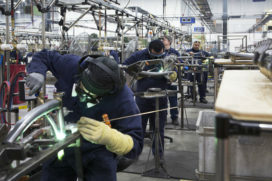 There were other small signs in 2016 of a UK bike manufacturing renaissance, with lightweight children’s bike manufacturer Frog relocating production from China to South Wales and talk of introducing mass production of steel bikes by Liberty House, following their purchase of Trillion Cycles. Looking even further ahead, Hero Cycles are clearly aware of the possibility of post Brexit trade deals, signalled by the opening of their global design HQ in Manchester. In the short term though the big question for most in the UK bike trade – who are largely dependent on the price of imports – is how long and how successfully extra costs induced by the weak pound can be absorbed or mitigated, especially now Article 50 has been triggered by the UK government. 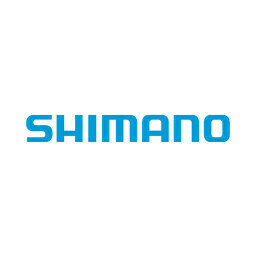 It is estimated that the independent bike sector, though having very slowing declined its market share in recent years, still accounts for 35-40% of bike sales. The major bike retail chain Halfords has a slightly smaller market share than all IBDs combined. One cloud on the Halfords horizon is the recent analyst downgrading of shares, despite the company’s greater emphasis on online sales and the growth of its high street stores, branded Cycle Republic. Halfords main chain competitor, Evans, saw its 2015 pre-tax profits plunge 69% but it is not yet clear how 2016 has treated the company who have also rolled out their own brand electric bike, as well as significantly increasing their third-party e-bike brand offering. Other chain competitors include Go Outdoors, whose 58 out-of-town superstores are now owned by JD Sports Fashion plc, who felt they complemented their own town centre locations. Earlier in 2016, pre-takeover, Go Outdoors invested millions in new stores and expanded its cycle product range significantly as a result. Decathlon also look to be making good progress and their 20 UK stores might expand in line with the company’s increase in profits and global expansion philosophy and it will be interesting to see if the Decathlon ‘City’ brand of stores are rolled out in the UK. With sales estimates varying it seems 50,000 plus is the current upper guesstimate according to those in the industry. 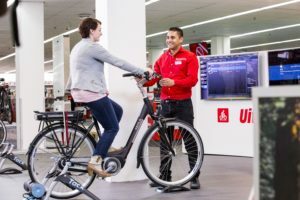 With e-bikes strongly entrenched at London and Birmingham bike shows, in many IBDs, Halfords and Evans it seems their strong growth is here for the short term at least. For example Whisper and EBCO both report a doubling of stock levels for 2017. 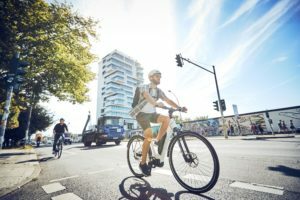 Of course the even bigger overarching question for the UK electric bike market is whether they can emulate the sustained success of Germany and the Netherlands – both countries with relatively widespread networks of high quality cycle paths and relatively high levels of cycle usage.